Bombing Ruins Gaza's Only Power Plant : The Two-Way Israel broadened its bombing campaign on Tuesday, bringing the Palestinian death toll above 1,200. Brief hope for a cease-fire was quickly dashed. 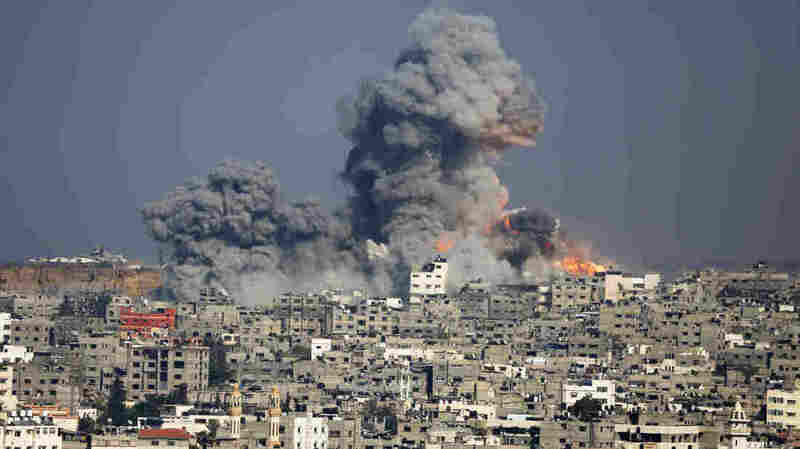 Smoke and fire rise from the explosion Tuesday in Gaza City. Israel broadened its assault on Gaza on Tuesday, reportedly wrecking the region's only power plant and killing more than 125 Palestinians. Barrages "destroyed Hamas's media offices, the home of a top leader and what Palestinians said was a devastating hit on the only electricity plant," The New York Times reports. Israel's military said it was looking into the Gaza power plant strike. The bombings came on a day when hope briefly arose about a new cease-fire. Both Israeli and Palestinian officials in the West Bank discussed the possibility. But Hamas, which runs the Gaza Strip, rejected the idea. "We don't accept any condition of cease-fire," Hamas military commander Mohammed Deif said on Hamas broadcast outlets. "There is no cease-fire without the stop of the aggression and the end of the siege." With Tuesday's bombings, which The Guardian described as "the most relentless and widespread" of the three-week-old conflict, the Palestinian death toll has exceeded 1,200. The shelling of the power plant, which Palestinian officials described as taking a devastating hit, will bring additional hardship. The lack of electricity will make existing problems with water and sewage far worse. "We need at least one year to repair the power plant, the turbines, the fuel tanks and the control room," Fathi Sheik Khalil of the Gaza energy authority told the Guardian. "Everything was burned." On All Things Considered, NPR's Emily Harris described how one family in Gaza spent the Muslim holiday of Eid, which marks the end of Ramadan. Some family members have been killed, others injured and nearly all displaced. "There are 53 people staying in this three-bedroom apartment," Harris reported, "including, the mothers say, at least eight infants." On the diplomatic front, there was disagreement between the U.S. and Israel about what had been said in private conversations among top officials. The White House dismissed as "totally false" a report on Israel's Channel 1 that President Obama told Israeli Prime Minister Benjamin Netanyahu during a telephone call Sunday that Israel must immediately end its military offensive in Gaza and was not in a position to choose which countries could mediate a cease-fire. "We have seen reports of an alleged POTUS-Netanyahu transcript; neither reports nor alleged transcript bear any resemblance to reality," tweeted the National Security Council's press account. For their part, Netanyahu's aides denied Secretary of State John Kerry's characterization of one of his many conversations with the Israeli prime minister. Kerry suggested Tuesday that Netanyahu had asked him to "try to get a humanitarian cease-fire," but the prime minister's staff said the cease-fire idea was actually Kerry's. An earlier version of this post stated that a power plant in Gaza had been shelled by Israel. However, the source of the strike was unclear and Israel's military said it was investigating.